This tutorial will be showing you 2 ways to install Nvidia graphics card driver on Ubuntu 18.04. The first method uses graphical user interface (GUI); The second method is done from the command line interface (CLI). Ubuntu comes with the open source nouveau driver which is included in the Linux kernel for Nvidia cards. However, this driver lacks 3D acceleration support. If you are a gamer or need to work with 3D graphics, then you will benefit from the better performance of the proprietary Nvidia driver. Note: Before installing the proprietary driver, I recommend disabling secure boot if you are using UEFI firmware. If secure boot is enabled, you might encounter problems after installing Nvidia driver. 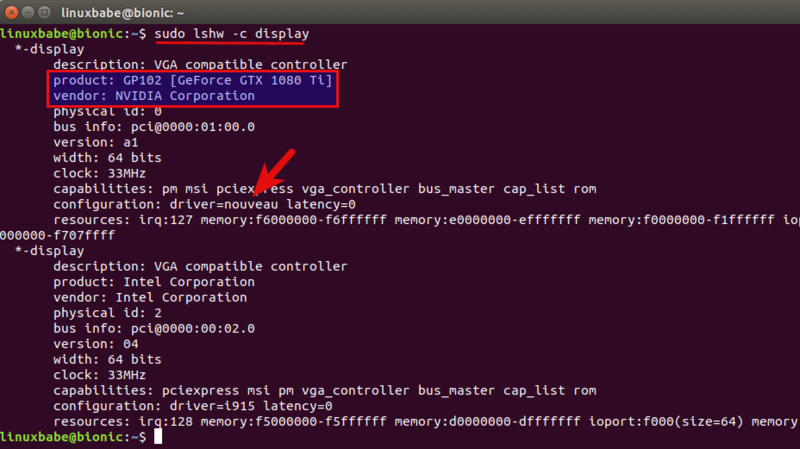 This tutorial also assumes that you are running Ubuntu 18.04 with x.org display server. First, go to system settings > details and check what graphics card your computer is using. By default, your integrated graphics card (Intel HD Graphics) is being used. Then open softare & updates program from you application menu. Click the additional drivers tab. You can see what driver is being used for Nvidia card (Nouveau by default) and a list of proprietary drivers. As you can see nvidia-driver-390 is available from my GeForce GTX 1080 Ti card. So I select the first option to install nvidia-driver-390. Your mileage may vary. There might be some other drivers for your particular card. Click Apply Changes button to install the driver. After it’s installed, reboot your computer for the change to take effect. 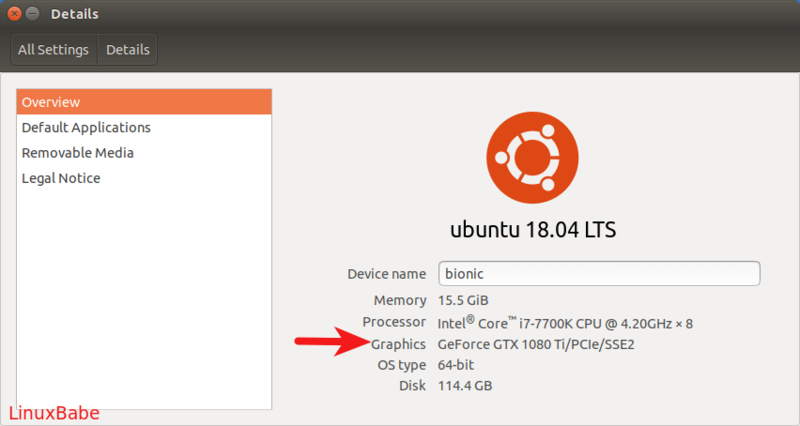 After that, go to system settings > details, you will see Ubuntu is using Nvidia graphics card. 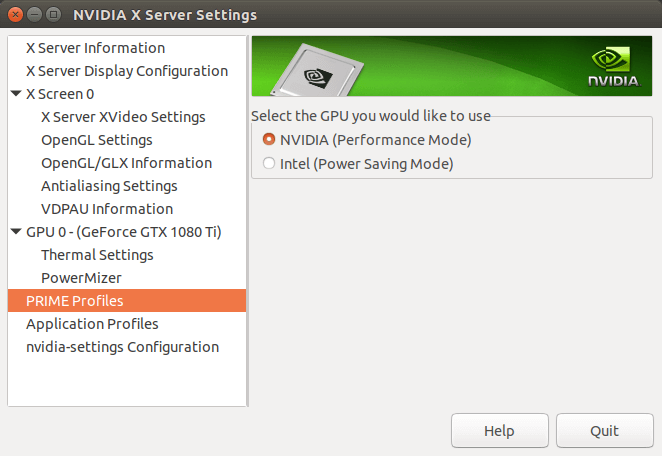 If you want Ubuntu to use Intel graphics card, open Nvidia X Server Settings from application menu. Click PRIME Profiles tab on the left pane, and then select Intel card on the right pane. To switch back to Nvidia card, simply select NVIDIA in PRIME Profiles. 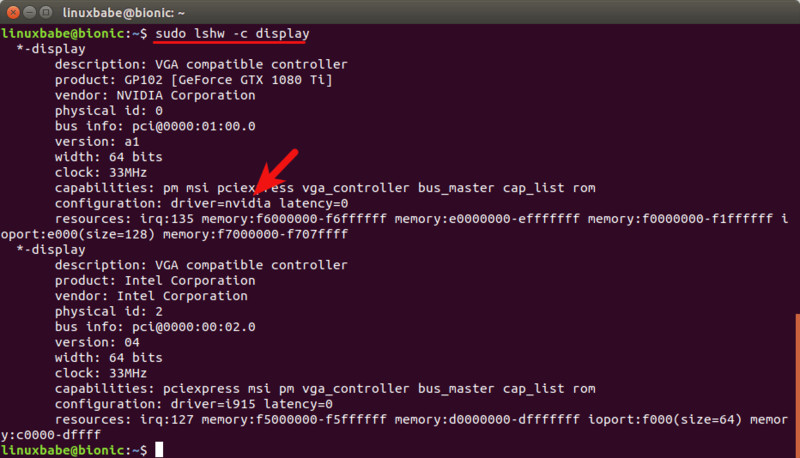 First, open up a terminal window and check which driver is being used for Nvidia card with the following command. You can also use video instead of display as the class name. By default, the open source nouveau driver is being used for Nvidia card. 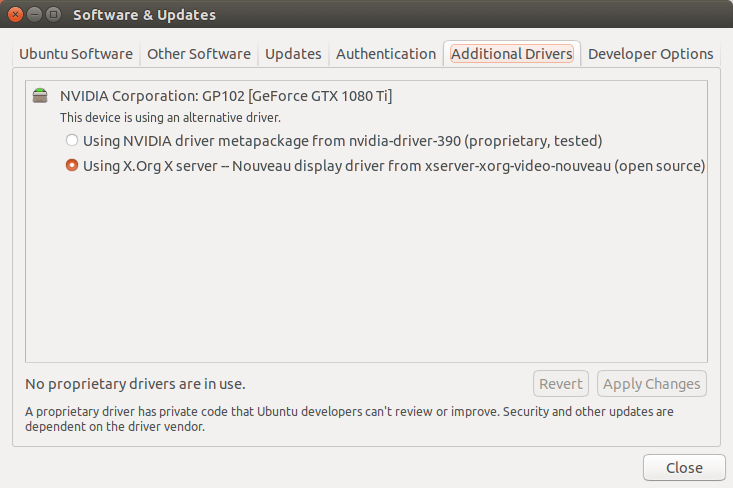 Next, run the following command to list available driver for your Nvidia card from the default Ubuntu repository. As you can see, there are only two drivers available for my GeForce GTX 1080 Ti card. One is the proprietary (non-free) driver, which is recommend by Ubuntu. The other is the default open-source Nouveau driver. There may be some other drivers for your Nvidia card. To install the recommended driver, run the following command. This will install some 32 bit packages as indicated by the i386 suffix. If you want to install a particular driver, run the following command. After the driver is installed, we need to reboot the computer to enable nvidia-prime, which is technology to switch between Intel and Nvidia graphics card. Now the proprietary Nvidia driver is being used. Notice that you may need reboot for the change to take effect. Nvidia website maintains a page for it’s latest driver for Unix/Linux platforms. On this page you can see the latest version of Nvidia drivers. At the time of this writing, the latest version is 396.24. Clicking the version number will take you to a page where you can see changelogs and whether you card is supported or not. The driver included in the default Ubuntu repository is outdated but more stable. If you would like to install the latest version, you can add a PPA maintained by Ubuntu Team. The newest version becomes the recommended driver. Now you can run the following command to install newest version. This PPA is still considered testing. Sometimes you might encounter dependency problems like below. If you prefer stability over bleeding-edge, you can quit installing it. But if you are willing to take risk, you can upgrade the libraries by running the following command. Then re-run the install command. If there are still dependency problems, you can manually install them. For example, I saw the following error message. I ran this command to fix the issue. Once the newest version is installed, reboot your computer. You can find the help files by running the following command. Repalce 390 with your driver version number. If for some reason you don’t want the proprietary driver any more, you can remove it by running the following command. 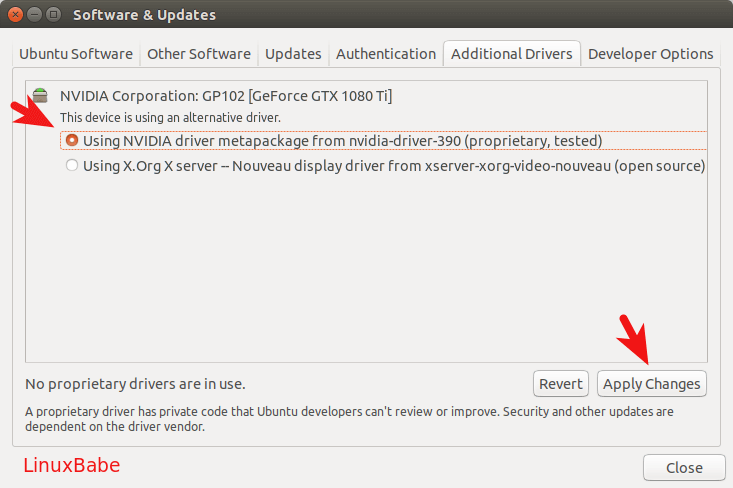 I hope this tutorial helped you install Nvidia driver on Ubuntu 18.04 desktop, either from GUI or from command line. As always, if you found this post useful, then subscribe to our free newsletter to get more tips and tricks. Take care. Thanks for this tutorial, can I ask, is it possible to switch the graphics cards without rebooting. do I need to switch cards and reboot, or can I set a profile that opens Davinci Resolve using the Nvida drivers? Also I’m assuming this would be fairly similar if running CentOS. Thank you very much for this clear method how to set Nvidia. I really appreciate your effort. For nabs like is essential to get this kind of support you are doing. This and many other things make me glad for dumping the Windows out of the windows. Hello, My disks are encrypted. I used the graphical user interface to install a new driver. I did not disable secure boot as I now see you had suggested. Now, I cannot unlock my startup drive when I restart the machine. Do you have any suggestions for reverting back to the old driver? I am using a Nvidia K620. Thank you. Hi, It’s a bit old post but maybe you can help. I did as you describe but in details the system still tells me I’m using the intel card even if prime-select query tells me I’m set for nvidia. Nouveau is blacklisted automatically if you install and enable the Nvidia proprietary driver, as can be seen in the file /etc/modprobe.d/nvidia-graphics-drivers.conf. Maybe you need to restart your computer to see the changes. or manually installing the missing dependencies didn’t really help and I couldn’t get past that point. any suggestion as to what to do next ? I desperately needed the UNinstall via commandline help found here to recover my machine after enabling the nvidia driver resulted in a black screen after login… thanks for including methods usable at the recovery console! Look for GRUB_CMDLINE_LINUX_DEFAULT= and add nomodeset between the ” “. Make sure to run update-grub from command line before rebooting. Any way to make Nvida GeForce 1050 Ti to run my 4K attached monitor at 60Hz instead of 30Hz? 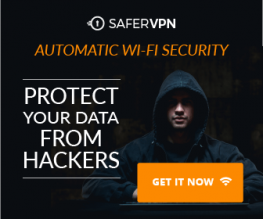 Using the latest stable Nvida driver on Ubuntu 18.04.